I've fixed the carry-all bug (which gets selected on box-selecting). If player is Ordos and Computer is Ordos and the player tanks/turrents don't attack enemy Ordos doesn't seem to be a consistent bug. Played skirmish earlier with ALL teams the same and things seemed to go without a problem. Tanks and turrents attacked enemy units with the same color as my team. Also I've again checked if the sandworm eats units. It seems like the sandworm does eat units, but I haven't seen it happen when the worm was on screen. I hear the sandworm eat when it isn't on the screen. -S does not work? What about G? as well. Can you check? Radar animation doesn't have any problems. It's only the light and heavy factory which don't have the lightning from welding. I don't know if a High-Tech Factory has welding lights in the original verison. -All borders? Or only the right/bottom? Units can also go offscreen at the topborder as well. I wasn't able to check the leftborder yet. I have checked DEMO 4, and built a unit from a Light factory. Once it is complete, i see the red light flash green and the unit comes out. Is that the 'welding' you mean? PS. Fixed another bug (Upgrade can be completed by clicking again on button bug). 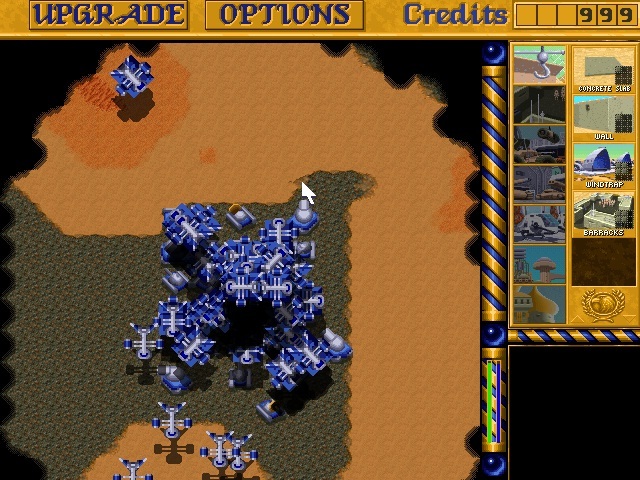 I've downloaded Dune 2 and played it till I was able to build Quads and Tanks. I always thought there was a white welding light in the factory when you were building a vehicle, but this doesn't seem to be true. Maybe I had another game (dune 2000 or emperor?..) in my mind which does have white welding light during vehicle construction. So I was wrong about the welding light, sorry about that. I'm not sure about Emperor, but Dune 2000 had those additional lighting when building a vehicle. Finally a decent infantry in Dune 2!Troopers are really strong...maybe combat tanks deserve a speed buff to squish them.Light infantry that is one of the most useless unit of RTS finally has a little victory:it is faster than troopers.I suggest to give some use to single soldier over the squad:while it is right that squad have more firepower,more range and more health,I would give to single soldier more speed because it is easier to run alone rather in formation. In the original Dune 2 Raider are strong as trike (less armor and better rof maybe,however they are a better vehicle because faster and equal strenght),but here they are really crappy:less than half armor and very poor range.Ordos wouldn't waste 125 credit for this kind of unit:they would do a cheaper UNARMED vehichle,or the best solution is an attack and strike vehicle.For example keep the very low armor,but put the range to 4 (instead 2) and you can use raider to kill infantry squad only. Infantry should be effective against troopers. Troopers are effective against vehicles/tanks. Troopers should not be effective against infantry. Trikes/Quads should be effective against infantry. About the Ordos Raider; it should cost less I agree, but also have weaker fire power then. There's a welding light on the Heavy factory animation on the Mentat screen, maybe you thought of that one. And in Dune 2000, there are welding light effects both in Light and Heavy factories. If troopers are not effective against infantry, wouldn't Harkonnen need to get Quads REALLY QUICKLY to counter infantry? -Units can exit the map on the left border as well. So every border of the playfield are opened in the demo. -The amount of tanks which can be ordered at the Starport seems to depend on how much money you have instead of how many tanks are in stock at the Starport. -sometimes harvesters just teleport away from a spicefield. They also teleport from the refinery to the spicefields sometimes. -When a carryall (carrying a unit) is hovering above an area where you want to place 4 concrete slabs, the square where the carryall is at the moment won't have a slab. -Repairfacility still has some bugs. I've just played another skirmish game and I had to use the repairbutton on a Siegetank 5 times before a carryall dropped it into the facility. The other 4 times the tank as picked up, the carryall hovered above the R.F. but dropped the tank next to it. -special weapons (saboteur, dead hand, fremen) aren't available in the Palace. Yeah Stefan mentioned earlier that Palace abilities aren't included yet. It does not happen in the latest version. Perhaps it does in DEMO 4. Perhaps you could double check this? It looks like it's a bug when the harvester was just transported by a carryall. When the carryall picks up a harvester from the refinery and drops it on a spicefield, you'll see the harvesting animation next to the refinery, on the spot where the carryall picked him up. The harvester will show op correctly (on his real position) once it starts to move to another spot. When the animation is showing in the wrong location (next to the refinery), the harvester isn't clickable on that spot. He is on his real spot in the spice field however. I saw this bug emerge too; I did not really had time to investigate it, by the time I noticed the harvester 'dissapeared' (probably appeared at its real location as you said). mmmmm...it cost 125,to be cost effective with this combo of firepower and armor should cost little more than a soldier - 90 credits. Found another bug in a skirmish with 4 teams. If the High-Tech Fac. is surrounded by buildings on -every- side the ornithopter can't exit the building. Have this idea about building walls: would it be possible to have the wall building procedure like Red Alert 2 or Emperor? This way it would be much more attractive to build them. Although not bug related, i have added the possibility to load your own custom ini file (instead of manipulating the original game.ini). This is handy for me, as testing, but it also gives you the possibility to create your own balanced game ini file, without destroying the original. Emperor's system is essentially the same as the classic system if I remember correctly. It's just that it goes through building the wall bit by bit automatically for you once you've indicated the length and orientation. I'm not sure how easy it is to implement this in the game. Red Alert 2 and patched Tiberian Sun use the auto connect system. The wall would have to cost more (indeed, after patching, the new wall system resulted in walls actually costing more per purchase). One is that you can 'place' walls already, but they will emerge after you have paid. This means you do not have to click and place all the time, but the building is done automatically. Second, you can place with the 'auto connect' system. Although the latter sounds 'easier' (and faster). I do think it is closer to the "dune 2 way" to do the first. I remember that in D2TSHA concrete (not sure about walls) is placed this way: you indicate as many tiles to get paved with concrete as you wish, and the conyard starts producing them as soon as the first one is placed. So you can define the future site for a building without having to go through the whole procedure of ordering the concrete slab to be produced and then placing it manually every single time. I think this is very reasonable, but in case of concrete this would render the large 2x2 concrete blocks useless. Likewise, in Emperor, you define the first and last segments of a wall, then each segment is produced automatically for its won cost. This is much better than the RA2 method IMO.